In 1966, Tamnavulin-Glenlivet Distillery Co built the Tamnavulin distillery, in order to satisfy the growing demand from whisky blenders such as Whyte & Mackay, Crawfords, and Mackinlay’s. It is located in the foothills of the Cairngorm mountain range in the rural town of Tomnavoulin, Scotland. In 1993, Whyte & Mackay became the owners of Tamnavulin when the company purchased Invergordon Distillers (the parent company of the Tamnavulin-Glenlivet Distillery Co. Ltd.) The distillery was closed in May 1995 and ownership was transferred to Kyndal International in 2001, and then to Whyte and Mackay Ltd in 2007. The distillery began operating once again in July 2007 after a major refurbishment with new automation and process control. 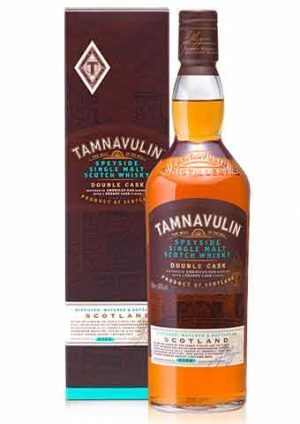 Tamnavulin was officially re-launched as a single malt in 2016, although independent bottling’s are sometimes available. Matured in American oak barrels for a sweet, mellow taste with a rich, smooth Sherry cask finish. Award winner. 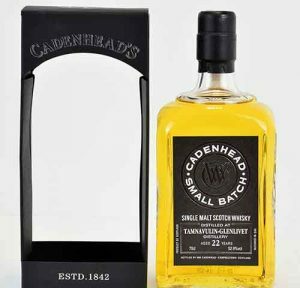 A 22 year old single malt Scotch whisky from the Tamnavulin distillery, bottled by WM Cadenhead. Distilled in 1992, bottled in 2014 at 52.9% abv, matured in ex-Bourbon hogsheads.